All milk in the United States is fortified with vitamin D, according to the National Institutes of Health. Vitamin D is needed for healthy bones and may have other important health benefits, but many Americans are deficient in this important nutrient, says registered dietitian Marjorie Nolan, M.S., from the American Dietetic Association. The body makes vitamin D when exposed to sunlight, but most people don't get enough sun exposure to generate a substantial amount of the vitamin. Drinking milk fortified with vitamin D is a simple way to get enough of this nutrient. One cup of milk provides 25 percent of the minimum daily recommended intake of vitamin D for adults, according to the National Osteoporosis Foundation. While cod liver oil and fatty fish, like salmon and herring, are the best natural food sources of vitamin D, most Americans don’t consume these foods regularly. About 15 minutes per day of exposure to the sun on a bright day will generate enough vitamin D to meet your daily requirements. However, it takes more time in the sun for dark-skinned people and those living in Northern regions of the U.S. to get the vitamin D benefits and sunscreen can diminish the benefits. Vitamin D milk is an alternative source. All dairy products, including milk, are rich in calcium. Broccoli and leafy, green veggies also have calcium, but it’s not as easily absorbed by the body as the calcium in milk. Milk is also loaded with protein and is a source of heart-healthy potassium and vitamin B-2, which helps keep nerves and red blood cells healthy. Milk also is a source of vitamin A, which is needed for healthy vision and to keep your immune system strong. The Harvard School of Public Health advises that milk can be high in saturated fat, a risk factor for heart disease. Choose low-fat or skim milk to help reduce the amount of fat you are drinking. 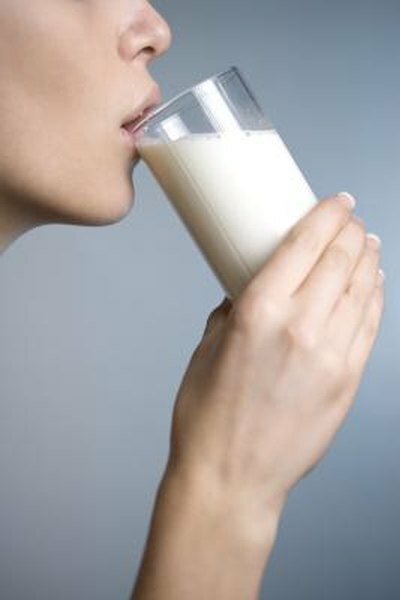 Some research suggests drinking milk may help with weight loss. In a 2005 University of Tennessee study, obese adults who consumed at least three servings of dairy products daily lost body fat without reducing calories. Drinking milk accelerated weight loss in subjects who were on low-calorie diets. Individuals with lactose intolerance may suffer unpleasant symptoms, including cramping and diarrhea, after consuming milk. Lactose intolerance is more common in Asians, African-Americans, Native Americans and Hispanics than in people of Northern European descent, according to the Harvard School of Public Health. True milk allergies are rare in adults, Nolan says, but it’s common for toddlers and preschoolers. Pediatric milk allergies can cause rashes and upset tummies in children. To get the benefits of vitamin D milk without the negative effects, choose low-fat or skim milk. Reduced-fat milk is often labeled 2 percent, which means it contains 2 percent fat, compared to 3.5 percent fat in whole milk. If you’re lactose intolerant, look for milk labeled lactose-free. You can also take a pill containing enzymes that digest the lactose in milk, according to the Harvard School of Public Health.